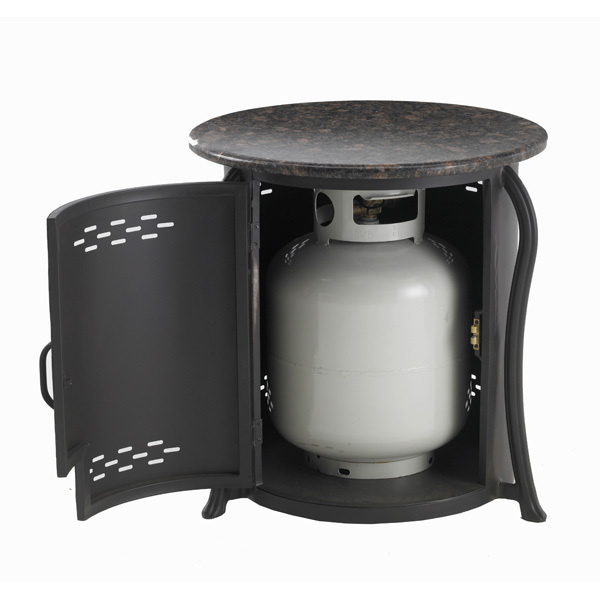 This propane tank cover doubles as a side table while conveniently hiding the unsightly propane tank. this cover/side table features an attractive granite top as part of your patio, deck, or greatroom furniture and decoration. This side table can hide a 20 lb. propane tank (tank not included), and measures 22 in. H x 21 in. W x 21 in. D. No one will ever know just what you are hiding behind this elegant piece. Is there a notch in the door to the table for the hose? There is a cut out in the lower right of the door. What color is the base? Is it brown, as it appears? Per the manufacturer, the base color of this item is indeed listed as brown. However, they state that it actually has a darker appearance in person, close to a charcoal coloration.